Explore resources provided by GOSA which target the educational success of students from birth through higher education. GOSA works to provide parents and students with access to information and data designed to educate and support decision-making processes in alignment with the state's educational objectives. An interactive dashboard that provides earnings information for Georgia graduates who work in Georgia after earning their degrees. The dashboard is searchable by degree type, specific program of study/major, and technical college and college/university. Explore Georgia Higher Learning and Earnings. A residential summer program for gifted rising junior and senior high school students. GHP offers instruction that differs significantly from the typical high school classroom and is designed to provide students with academic, cultural, and social enrichment necessary to become the next generation of global critical thinkers, innovators, and leaders. Learn more about the Governor's Honors Program. A school comparison tool based on student populations, school letter grades, and the College and Career Ready Performance Index (CCRPI) Compare schools with Schools Like Mine. 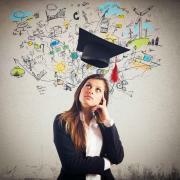 GAFutures: Access resources and aid programs to begin planning for success in college. Quality Rated: Find quality child care and summer camps. Ready4KGA: Sign up for free early education activity-based text messages to boost your child’s learning. Words2Reading: Support early language and literacy development through quick, accessible, easy-to-use resources.